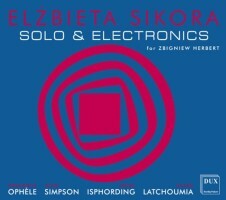 Elżbieta SIKORA: The Head of Orpheus II (1981-82)1; Suite for cello and tape (1990)2; Suite II for harpsichord and tape (1993)3; Reflets irises (2005)4. Emmanuelle Ophèle1 (fl), Marc Battier1 (electronics), David Simpson2 (vlc), Gośka Isphording3 (harpsichord), Wilhem Latchoumia4 (pno). DUX 0679a (1 CD) (http://www.dux.pl/). Stefano SCODANIBBIO: Oltracuidansa (1997, rev. 2001). Stefano Scodanibbio (cbs). mode records 225 (1 CD) (http://www.moderecords.com/). Roberto FABBRICIANI: Alchemies (2000-04). Roberto Fabbriciani (fl). Brilliant Classics 9446 (1 CD) (http://www.brilliantclassics.com/). 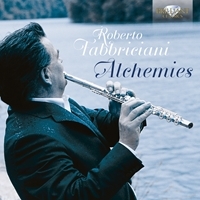 In four absorbing parts, Mercury, Salt, Sulphur and The Imponderable (Paracelsus’ names for the base elements: water, earth, air and fire), Fabbriciani combines flutes and all manner of extended playing techniques with tape to manufacture colorful panoramas suggesting dangerous primeval mysteries. Electronics and distorted flutes, including the breathy and ultra-low hyperbass flute, depict this eerie cosmos. Sulphur offers the most familiar flute airs, but Fabbriciani and his backdrop make them fierce and unwelcoming. Play it loud to frighten the neighborhood pets. 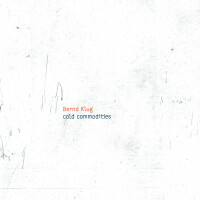 “Cold Commodities.” Bernd KLUG: Var. comps. Bernd Klug (cbs, e-bass). Innova 902 (1 CD) (http://www.innova.mu/). Captured in one Brooklyn apartment during a single month (September 2013), bassist Klug melds crackerjack extended technique with his mundane physical environment to create fables. Immediately one encounters a small-room ambiance with varying weights of interference. I suspected multi-tracking, yet Krug’s brief note avows no such effects. “Guest artists” include local electronic gadgets and the sonficiation of mundane documents. Suffering with Mexican Music portrays Klug valiantly competing against a neighbor’s unwanted noise. New York is the city that never sleeps, and thus Rauschgespraech’s chalky bass captures being startled awake at 2:00 a.m. by vulgar street sounds. The longest track, Traces Within a 1-Bedroom Apartment, explores the instrument’s rich harmonics. 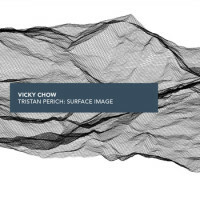 Tristan PERICH: Surface Image (2013). Vicky Chow (pno). New Amsterdam Records NWAM060 (1 CD) (http://www.newamrecords.com/). There are times in Perich’s 63-minute opus when the piano is subsumed under glaring bursts of electronic pulsing, like a flashing neon sign competing with the sun. The digipak photo reveals Chow at the piano, flanked by 40 dinner-plate-sized speakers. I suspect each speaker emits just one pitch at a time, and are controlled so they phase and hum against the piano’s minimalist cascading patterns. The work’s grand scale offers deliberate sections gradually changing, but both electronics and piano get a rest now and again. The work reaches for something monumental, despite its garage-floor technology. 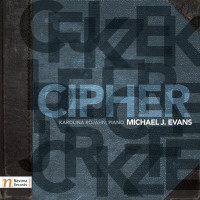 Michael J. EVANS: Cipher (2013). Karolina Rojahn (pno), Kyle Milner (voice). Navona NV5962 (1 CD) (http://www.navonarecords.com/). All variations are but a type of distortion, no? Evans explores artistic fidelity, taking Mendelssohn’s text (a weakly translated letter excerpt) and music (a few bars from a Song without Words) through an eclectic series of variations. Part one opens upon distorted speech whose noise clears away gradually upon repetition only to reveal jumbled words. Part two is 24 variations plus fugue on the opening of Mendelssohn’s Op. 19, No. 1. The variations traverse styles on their way to the present via ragtime, Satie and Glass without shaking free of the original. The last text statement overlaps with the piano theme to unite the parallel treatments. The concluding fugue is an apotheosis, fragmenting the theme and passing through different states. Rojahn emphasizes Mendelssohn’s inherent intimacy, and as virtuosic as the 52-minute variations become, like the original letter, they are presented as if for a modest audience. Additionally, the packaging includes a clear cd-sized code wheel so that we may solve a simple cipher and grab further music from the Internet. 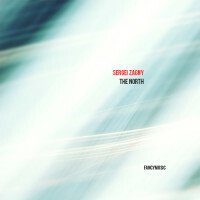 Sergei ZAGNY: The North (2011-13). Sergei Zagny (sop recorder). FANCYMUSIC FANCY028 (1 CD) (http://www.fancymusic.ru/).